Bonnie is the stunning original CradleKit by sculpted by Linda. She was the very first standing CradleKIt and is still as popular today as she ever was. This very successful CradleKit contains the vinyl head, three-quarter length arms and legs made of the most beautiful German vinyl. Bonnie is 29" when completed. A superb Ultrasuede body specifically designed for Bonnie is also included as standard. The Ultrasuede doe suede material body has cotter pin joints and is strung through the neck, arms and legs with colour co-ordinated cord. This body is firm yet snuggly and is perfectly proportioned. As with all genuine CradleKits, a beautiful Certificate of Authenticity accompanies the kit. 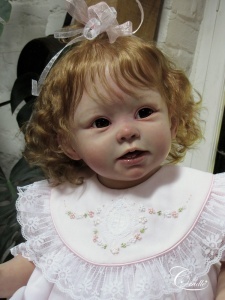 We recommend that you use the 24mm Lauscha Human glass eyes as used in the original. The realism that is achieved in the reborning starts with the fine detail of the sculpt and the meticulous work that is carried out right through the creative wax mold making process and into the metal molds for the production of the vinyl parts. The Ultrasuede cloth bodies are produced to the same exacting standards. 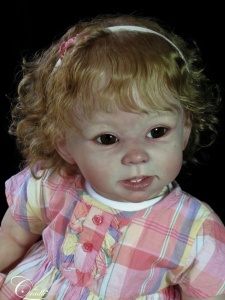 The photographs show Bonnie reborn and completed by Helen Jalland. 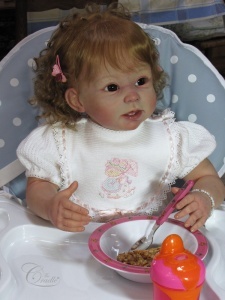 Bonnie will come to you as an unpainted vinyl 'kit' that will required full reborning.